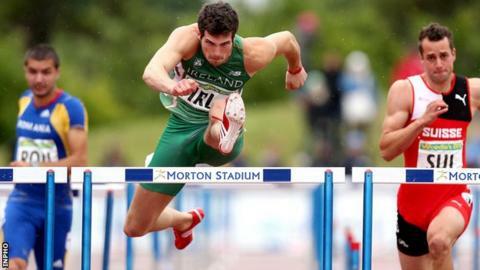 Ben Reynolds will compete in the 110m hurdles at the World Championships later this month after being added to the Ireland team for Beijing. The Holywood hurdler is one of four athletes coming into the team under the new IAAF quota system. This is available to non-qualified athletes who are in the top 50 in this year's world rankings. Kelly Proper (200m), Sara Treacy (3000m steeplechase) and Ciara Everard (800m) are also included. Athletics Ireland announced an initial 11-strong selection on Monday, with the total now boosted to 15. Ciara Mageean will miss the World Championships on 22-30 August after she asked not to be considered for selection. Given the Portaferry woman's history of injuries, she has opted not to compete in China. Mageean missed all of the 2013 season and much of 2014 after being troubled by an ankle injury. Reynolds, 24, appeared reasonably confident after winning the Irish title on Sunday that he would get the call for Beijing and will head to China in good spirits after improving his Northern Ireland record to 13.48 seconds earlier this month. In that race in the English Championships at Bedford on 1 August, Reynolds cut .01 off his previous personal best as he defeated last year's European Championship and Commonwealth Games silver medallist William Sharman. "Momentum is picking up. Pace is picking up. I'm letting the quality flow now and letting the pace come through," said Reynolds after his Irish title triumph at Santry.